In this special preview from our upcoming print magazine, available March 21st, Om’Mas Keith reflects on his collaboration with Brandt Brauer Frick. I first heard about Brandt Brauer Frick from my buddies over at Red Bull Music Academy. I’m assuming that BBF had heard some of my material, were aware of some of my earlier works with Sa-Ra Creative Partners and such, and reached out to get in touch with me. They sent me a track and some links; I did my research and fell in love with their aesthetic. They sent a great track over, so it was kind of like a double whammy of great original music that they wanted me to feature on along with their repertoire of past music. I liked their sense of musicality, their orchestration, and their choice of instruments. I really liked how they depicted themselves, as well. What they sent me [track “Plastic Like Your Mother”], in their perception, was somewhat skeletal, rough, and unfinished. When I heard it, I viewed it as complete, their sonic rhythm bed. I took their “skeletal form” and kept it just as it was. It kind of blew their minds, because they didn’t even see a form in the structure at all, and I immediately honed in on some key elements and used them to play off what I would go on to contribute. I wrote some lyrics, added vocals; I added some music as well and did some brief editing, added percussion and claps—but still kept their form completely true. I’m only on one song on the album, but they said in an interview that I’m the only person on the record whose contribution was wholly and solely created in his own world. I did all my contributions to that song without meeting them or any further consultation. I guess the song was so good they asked me to come out and tour with them. I’m a multi-instrumentalist, a vocalist, and a producer, and another area they’re delving more into is a more electronic sound this go round. I guess they just felt I was able to bring that. Personally, I think they made the right choice. Based on what I’ve observed since I’ve been here, and what I’m able to contribute, it’s seems a proper fit. My career is deeply rooted in very individual, creative statements. It started with the group Sa-Ra; our whole demonstration was rooted in our our desire to just be ourselves at any costs. I’d actually agreed to come out on tour with BBF prior to actually winning a Grammy. Looking at it now, this is really the perfect complement, almost a reward for getting the Grammy [as producer for Frank Ocean‘s Channel Orange for Best Urban Contemporary Album]. Go to Europe and have fun for a month with your good mates who think the same way you do creatively? Come on. There’s nothing to be surprised about, because this is just as big as any other thing that I do. The record as a whole is pretty heavy. I heard it early on, with Daniel [Brandt] at his flat. Once again, I was just blown away by the intricacies and the rhythmic permutations, all the subdivisions. These guys continue to show that they’re really talented and put a lot of thought into what they do. It’s heavy. It’s deep. It’s very sonically pleasing and edgy. I’m going to be singing vocals on tour. The Jamie Lidell song, in particular, they’d been performing live and had never had the opportunity to perform it with a vocalist. So, Daniel was like, “Okay, do you think you’ll sing this song with us?” And I was like, “Yeah, of course I’ll sing it.” I love the vocals, I loved all the vocal contributions. The guys, they had a focus in mind. 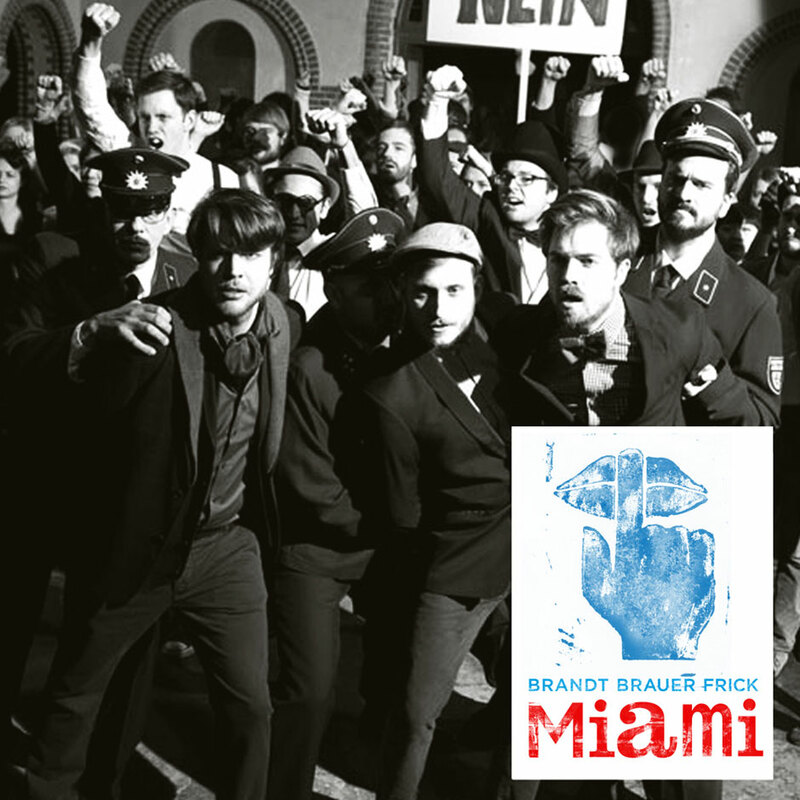 Brandt Brauer Frick’s album Miami, featuring Om’Mas Keith, Jamie Lidell, Nina Kraviz, Gudrun Gut, and Erika Janunger is out on March 11th, via !K7. BBF and Om’Mas Keith are on tour now. Follow Om’Mas on Twitter here.